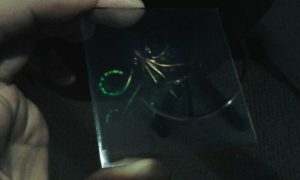 These are the best holograms I was able to produce using the kit from Integraf. Follow this link: http://www.integraf.com/hologram_kit.htm if you want to get a kit, they are not as easy as they seem but once you get the right timing of exposure and chemical washes, the results are amazing. You will get PLENTY of chemicals to last you for several months, so definitely cover them up from any air and put them in a cool, dark place and they will keep. Here is a gallery of the images and setup I made in my washing room. I chose the washing room because it has the least amount of air, and the smallest vent, plus, it’s very dark in that room. So, the key is to make sure you are in complete control of the environment, even down to air flow when you make these. 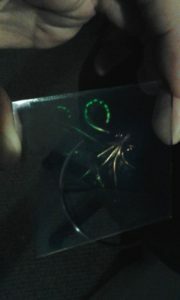 You will have to hold your breath or breath away from the setup so that you don’t cause refraction of the laser light. So this year I’ve set up a small darkroom inside of a storage room at our high school. I’ve also made some paper files that would help others to set this up and also a cover template for the glass slides to protect them. I would highly encourage someone to come up with a simple good looking frame, perhaps made of cardboard that the kids can make / decorate. You’ll need A LOT of deionized water. About two gallons, it’s super cheap, go to the grocery store, they sell it. Make no mistake – you must wear gloves for the entire process of mixing and developing, you don’t want this stuff on your fingers. You might want to double glove during developing because the glass corners tend to prick thin gloves, then you’ve got NaOH eating your fingers. Dry chemicals are all in powder form, except for the copper sulfate and the potassium bromide. These two are in chunk form. I would suggest leaving them in the bag, perhaps putting them each in a new baggie (bag in a bag) and then tenderizing them by bashing with a hammer, book, something. 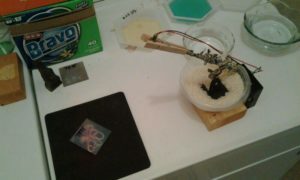 This will at least get them into a semi-powder state easier to dissolve. The amount of laser light and the position of the light is easiest to see if you place a book or block of wood or something non reflective behind your object as a dark backdrop. The laser light with hit the object and create a shadow onto the backdrop, this will help line things up. You want the object to be somewhat flat – the flattest being a coin, but also somewhat 3-dimensional. I found that a metal lapel broach worked really well, it has a depth of about 1 cm. I tried another Buddha figurine that has a depth of 2cm in some areas and it wasn’t as “bright” as the others with more flatness. Keep a bad slide around as a test slide for your setup and alignment. Don’t pull out a good, undeveloped slide until the very last minute, you don’t want to expose it. 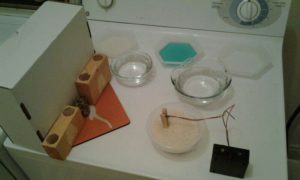 The rinse basins that the kit comes with aren’t that great, they work, but they’re pretty flimsy. I would suggest investing in some dollar store bins that will last longer and not break. Remember you’re working with chemicals so the smaller the bin, the less chemical you need, BUT you have to dump and clean it out if you do a bunch of developing and then refill it. A larger bin will require more chemicals, but less dumping and refilling… I’m going with slightly larger thicker plastic bins. Use a plastic cup to hold your slide in, it will naturally position itself vertically in the cup and the cup will catch the water. This way you can move it around without touching it while it dries. You can also use a blow dryer to gently dry it off in the cup. 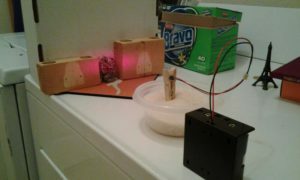 I put the objects around 25-30 cm away and then exposed them to the 4mW laser for 25 – 30 seconds. 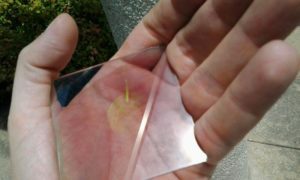 After the holographic plate is exposed, hold it by the edges with your gloved hand, with the emulsion side (sticky side) facing upward. Development: Quickly submerge the plate into the developer so that all parts get wet evenly. Agitate it for about 10 to 20 seconds.The hologram should turn black. Rinse: Rinse the developed hologram in distilled water with agitation for about 20 seconds. Bleaching: Place the rinsed hologram into the bleaching solution; agitate it until the plate is completely clear (this may take up to 1 minute); bleach for another 10 seconds. Rinse. 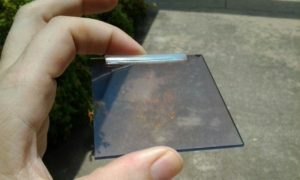 Rinse the bleached hologram in distilled water with agitation for about 20 seconds. Wetting agent: Place the finished hologram in this solution for about 20 seconds. SLIDE PROTECTOR – to protect your glass slides, print this template out and use cardboard as a simple kid-friendly slide protector that will last a long time, they can decorate it as well and use it as a double sided frame. You’ll need cardboard, scissors and some tape. DEVELOPING STATION LABELS – use these labels as seen in my pics that indicate the wash sections and the time needed. Just print and cut out.